Homegrown Swiss Chard is delicious stir-fried! | Grow Your Own Veg Blog. Gardening and Food Blog. Homegrown Swiss Chard is delicious stir-fried! Fancy some bright sherbet coloured vegetables for dinner? 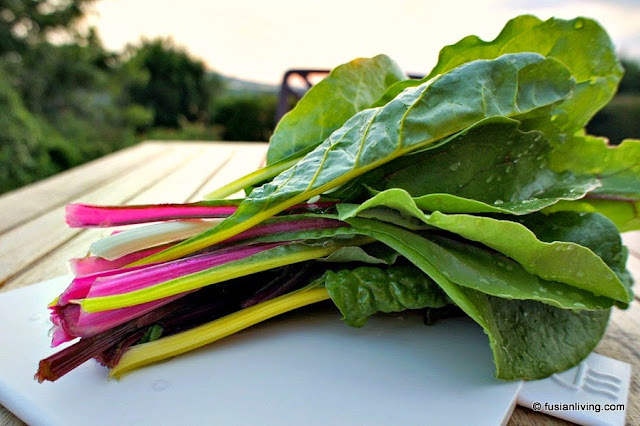 Try growing rainbow coloured Swiss Chard in your kitchen garden; it is closely related to Spinach, and has a similar, but more delicate taste. It's stems grow in a variety of colours - pink, yellow, cream and orange, so very enticing, which makes me wonder why this vegetable is not more commonly found on supermarket shelves, as they make for a lovely change to ordinary green vegetables. It is also a great alternative for Chinese/ Asian greens. As Chard matures, it grow thick stems, and these are crunchy and a bit like celery stalks. Harvest the leaves and stems whilst they are young, as they will also be lovely and sweet. Leave them for too long, and the stalks become tough and stringy. According to this article, chard is "a nutritional powerhouse, a superb source of calcium and potassium, vitamin C, vitamin A and beta-carotene". During these hot summer evenings, we have Swiss Chard a few times a week. I sow seeds every few weeks, so we have a continuous supply of fresh chard. 1. Wash the Swiss Chard thoroughly. Separate the stems from the leaves. 2. Place the oil into a wok on a medium heat. After a few minutes, add the chopped garlic and sea salt. 3. As the garlic starts to sizzle in the oil, add the Swiss chard stalks. Move it around in the wok quickly. Add the leaves. 5. After a few minutes of cooking, turn off the heat and remove from wok. Serve drizzled with oyster sauce (this can be salty, so use in moderation).